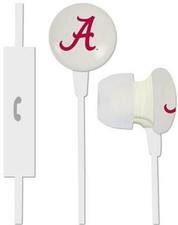 NCAA Ignition Earbuds + Mic - $19.99 - GolfersEdgeOnline.com - Best Golf Equipment On The Web! Show your school spirit and listen to great sound with the Air Force Falcons Ignition earbuds from AudioSpice! These premium earbuds produce rich sound and deep bass. The inline mic makes it a breeze to switch from music to calls without missing a beat! If you have any more questions about the NCAA Ignition Earbuds + Mic; do not see the model you are looking for; need custom options; or prefer to not purchase online, then please call us at (630) 656-1291.